Most people that attended the expo had never heard of FasTracKids before, but nearly everyone that stopped by the booth found FasTracKids to be a unique, cutting-edge educational program. They were surprised by how much information children learn and absorb at such a young age. Their realization supports independent research showing that the most important learning years for children are from zero to eight years old. It is during these years in a child’s life that vital brain connections are formed. The more connections that form in a young child’s mind, the greater that child’s capacity for learning will be. 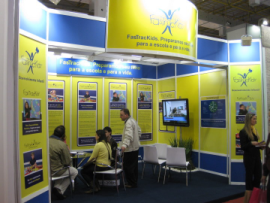 The majority of responses from parents of FasTracKids in Brazil are positive. Parents who are unfamiliar with FasTracKids sometimes are a bit skeptic of the program. They wonder if children so young can actually benefit from our curriculum. Parents who have given their child an opportunity to participate in a Free Discovery Class or who have a child enrolled in a program have nothing but great things to say about FasTracKids. Children in Brazil only attend school on a part-time basis until age seven. Many parents are looking for educational activities and curriculum-based programs for their children before they reach age seven. Educational programs are few and far between for preschoolers, so FasTracKids Brazil is unique to an age group in a country that doesn’t normally have early childhood education. Obviously we are very encouraged by the responses we have received from our FasTracKids parents in Brazil and hope that this is a start to a growing opportunity for young children’s development.